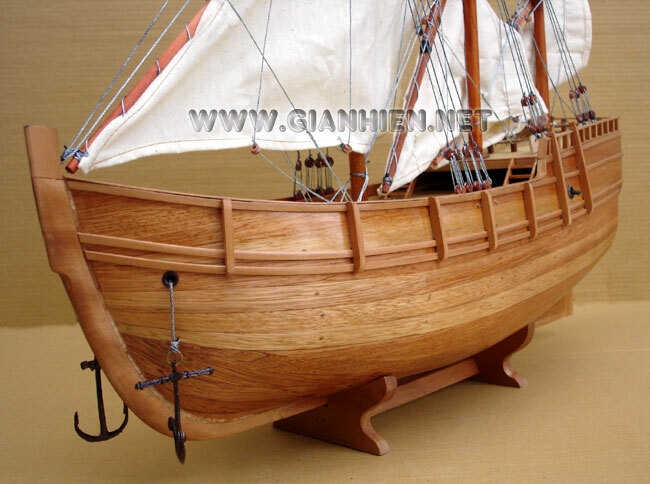 This model is hand-crafted from wood with planks on frame construction method. 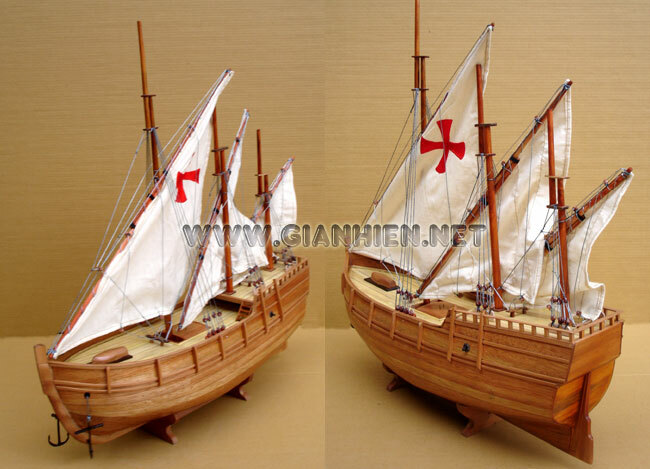 As everyone knows, Christopher Columbus had three ships on his first voyage, the Ni�a, the Pinta, and the Santa Maria. The flagship Santa Maria had the nickname La Gallega. It was a nao, which simply means "ship" in old Spanish; today, we might call such a ship a carrack. She was fat and slow, designed for hauling cargo, not for exploration. Some sources say that the Santa Maria was about 100 tons, meaning that it could carry 100 toneladas, which were large casks of wine. There has been much speculation about just how large such a ship would be; the best current thinking, by Carla Rahn Philips, puts the length of Santa Maria at 18 meters, keel length at 12 meters, beam 6 meters, and a depth of 3 meters from keel to deck. The Santa Maria had three masts (fore, main, and mizzen), each of which carried one large sail. The foresail and mainsail were square; the sail on the mizzen, or rear, mast was a triangular sail known as a lateen. In addition, the ship carried a small square sail on the bowsprit, and small topsail on the mainmast above the mainsail. The Pinta was captained by Mart�n Alonso Pinz�n, a leading mariner from the town of Moguer in Andalucia. 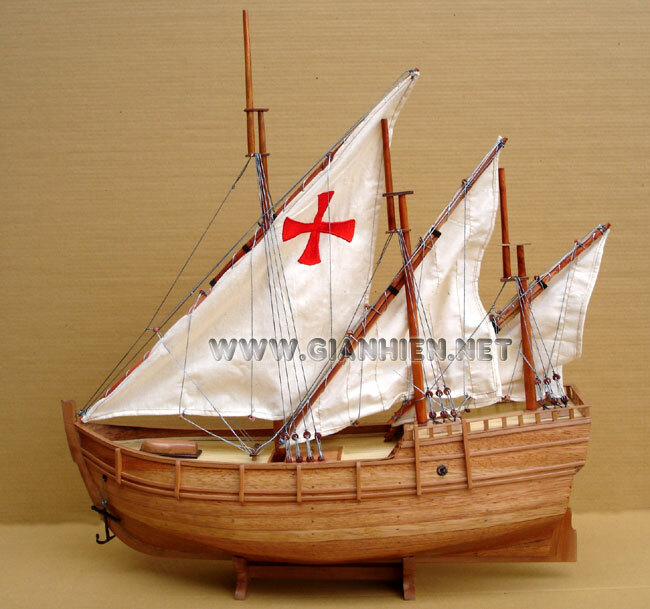 Pinta was a caravel, a smaller, lighter, and faster ship than the tubby Santa Maria. We don't know much about Pinta, but it probably was about 70 tons. 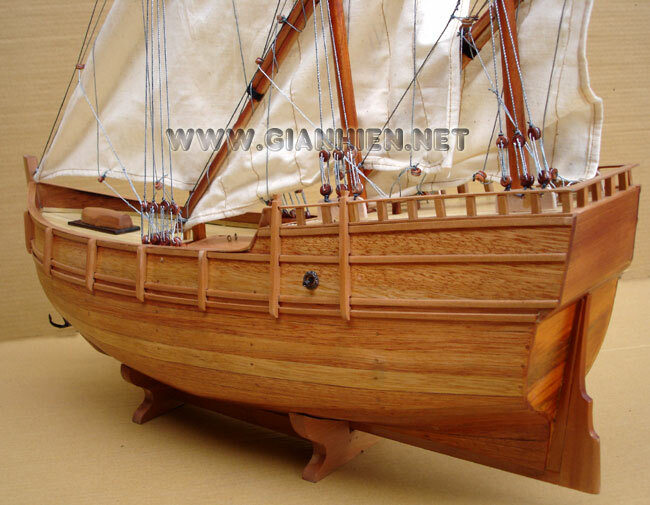 Philips puts the length of Pinta at 17 meters, keel length 13 meters, beam 5 meters, and depth 2 meters. She probably had three masts, and most likely carried sails like those of Santa Maria, except for the topsail, and perhaps the spritsail. Smallest of the fleet was the Ni�a, captained by Vicente A�es Pinz�n, brother of Mart�n. 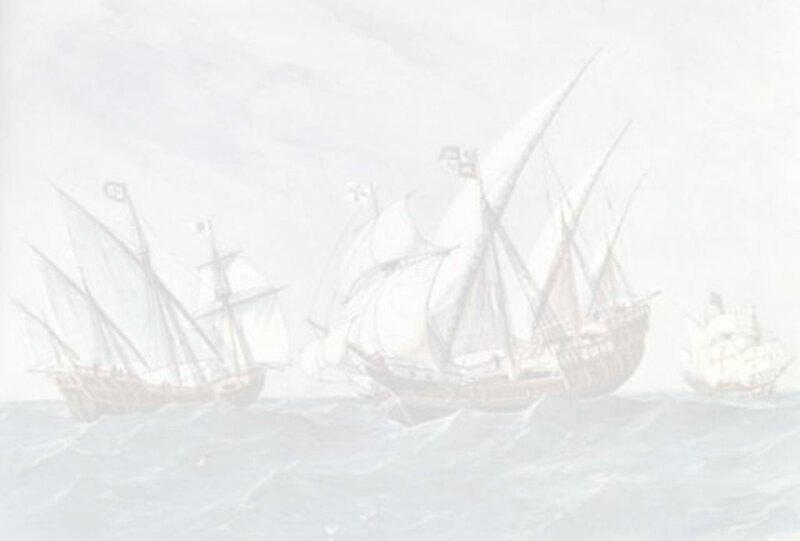 The Ni�a was another caravel of probably 50 or 60 tons, and started from Spain with lateen sails on all masts; but she was refitted in the Canary Islands with square sails on the fore and main masts. Unlike most ships of the period, Ni�a may have carried four masts, including a small counter-mizzen at the stern with another lateen sail. This would have made Ni�a the best of the three ships at sailing upwind. Philips puts her length at 15 meters, keel length 12 meters, beam 5 meters, and depth 2 meters.